Many studies over the years have shown that it is never too early to introduce your child to music. Regardless of whether he or she truly comprehends the music being played, simply listening has been reported to reduce stress and anxiety, improve sleep, and sharpen memory and mental alertness- according to an article written by Katie Gagnon. While all of these benefits stand true no matter what age, it is said to be more distinguished among young children with developing brains. These long-term benefits that can take effect include, "improved language development, enhanced motor skills, better social skills, higher IQs, increased concentration and basic memory recall" (Katie Gagnon, May 2018). 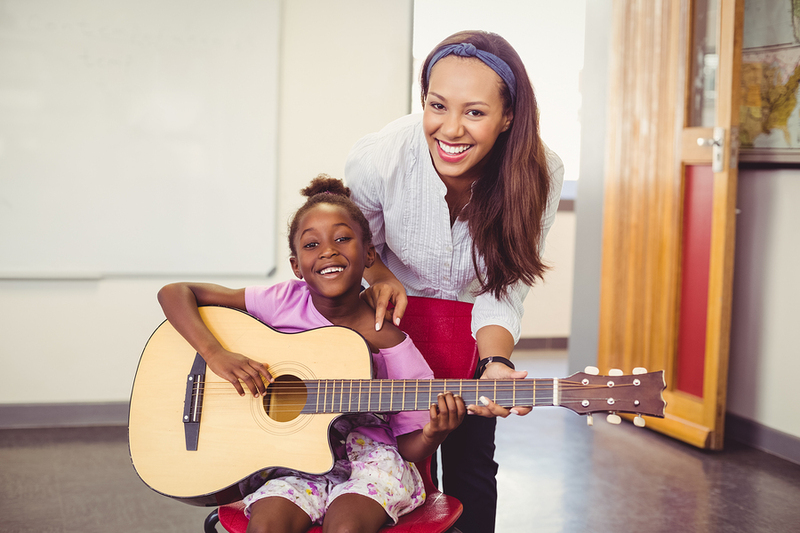 If you would like to see even greater mental and physical benefits in your child, consider signing them up for music lessons where they are taught to read music or play an instrument. The more involved your child is in music, the better your child's chances are of experiencing these benefits. 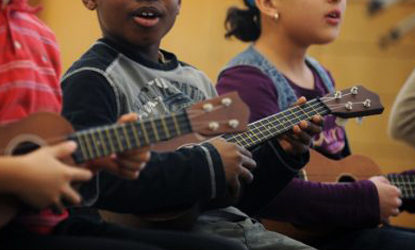 There are a plethora of options for having your child enrolled in music, and these activities can evolve as the child grows older. While these activities may not stay consistent throughout their childhood years or even their whole lives, building an appreciation for music in your child from a young age can increase the chance in them being involved in music for the rest of their life. 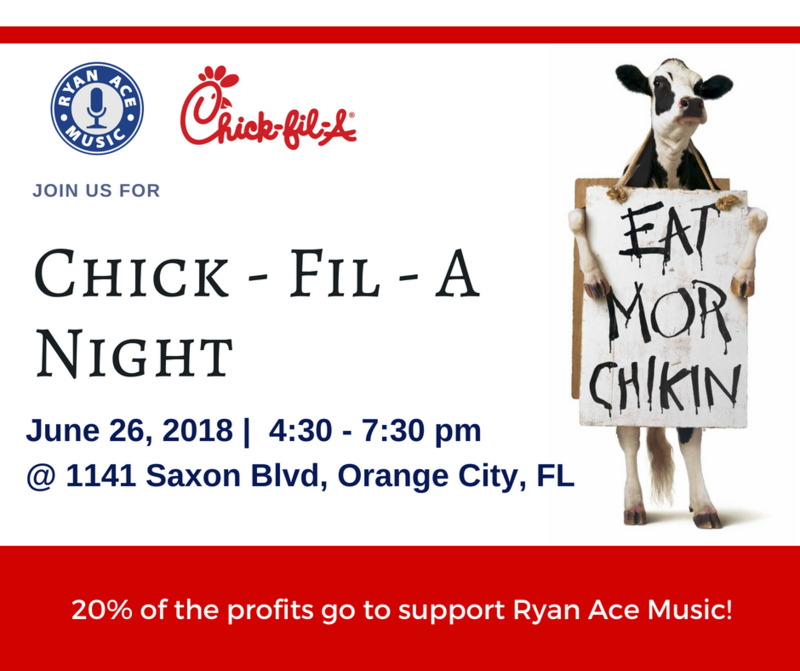 Ryan Ace Music is hosting a fundraiser at the Chick-fil-A in Orange City! On Tuesday, June 26th from 4:30pm - 7:30pm, make a purchase and mention our name (Ryan Ace Music) to have 20% of your purchase donated to the Ryan Ace Music Foundation. Our foundation makes it possible to help any child in need have the opportunity to become the musician they dream to be, funded by sponsors and awesome people just like you! Come out on the night of June 26th to help support young musicians in the Central Florida area! The Chick-fil-A cow helping out at the Ryan Ace Music Fundraiser. Ryan Ace Music had it's first fundraiser last week with the help from Chick-fil-A! Thank you to Chick-fil-A and to everyone who came out to support and eat with us! Every so often, Chick-fil-A has a Spirit Night, where it hosts a local organization in the efforts of raising funds. For every person who places an order and mentions the name of the organization, 20% of the purchase is donated towards the organization's cause. Local community sports clubs, schools, and other organizations can have a spirit night at Chick-fil-A. Stay updated for any future fundraisers and events that might be in your area!